The World Health Organisation and the World Bank estimate that one billion people experience some form of disability. Of those, it is estimated that 93 to 150 million are children. According to Plan International these children are 10 times less likely to go to school than other children and when they do attend school, it is likely to be in a segregated setting. The Global Partnership for Education estimates that 90% of children with disabilities in low and lower-middle income countries do not go to school. In 2016 the UN reported that less than half of the world’s six million refugee children were in school whilst in a report on the education of Syrian refugee children, Human Rights Watch identified that refugee children with disabilities faced particular and ongoing barriers to school enrolment. Historically, children with disabilities have been excluded from the general education system and placed in ‘special schools’. In some cases, they are separated from their families and placed in long-term residential institutions where they are educated in isolation from the community, if they are educated at all. Both practices persist in many regions, for example, Eastern Europe has the highest number of institutionalised children in the world and a child with a disability is almost 17 times more likely to be institutionalised than other children (UNICEF, 2012). Children with disabilities have very low rates of initial enrolment. Even if they do attend school, children with disabilities are more likely to drop out and leave school early without transitioning to secondary school and beyond (GCE, Equal right, equal opportunity report, 2014). Children with disabilities are also at increased risk of school violence and bullying, preventing the safe enjoyment of their right to education (UNESCO, School violence and bullying: Global status report, 2016). Human rights law seeks to directly tackle these issues by placing obligations on states to respect, protect, and fulfil the right to education of people with disabilities, through the implementation of ‘inclusive education’. For more information on the issues affecting people with disabilities’ right to education, see: World report on disability (WHO & World Bank, 2011: p.203-227), Plan International’s report Include us! (2013), and UNICEF’s report The state of the world’s children 2013: Children with disability (2013). People with disabilities are recognised under international law as rights-holders, with a right to education without discrimination and on the basis of equal opportunities. This right is guaranteed by the International Covenant on Economic, Social and Cultural Rights (1966) and the Convention on the Rights of the Child (1989). People with disabilities are also protected by a specific treaty that interprets existing human rights law in a manner that takes account of the specific situation of people with disabilities. The Convention on the Rights of Persons with Disabilities (2006) sets out the right to education as applied to people with disabilities in Article 24, and has been interpreted by the Committee on the Rights of Persons with Disabilities in General Comment 4: Article 24: Right to inclusive education (2016). 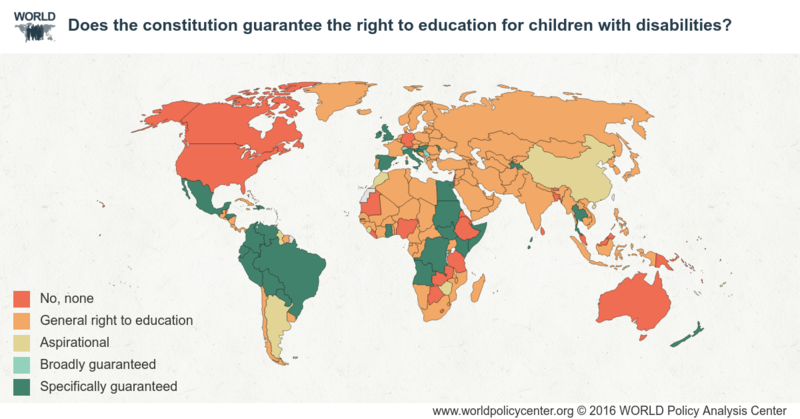 Despite the relative strength of international law in guaranteeing the right to education of people with disabilities, at the national level very few states guarantee the right to education of people with disabilities in their national constitutions. The legal definition of persons with disabilities includes those who have long-term physical, mental, intellectual or sensory impairments which, in conjunction with attitudinal and environmental barriers, may prevent them from fully and effectively participating in society on an equal basis to other people (Article 1, Convention on the Rights of Persons with Disabilities [CRPD]). It is important to note that this definition is prefaced with the word ‘includes’ and is not exhaustive. In recognition that disability is an evolving concept, the Committee on the Rights of Persons with Disabilities (‘the Committee’) states that this definition is not intended to limit wider definitions of disability found in national laws (such as persons with short-term or intermittent disabilities). The drafters of the CRPD were clear that disability should be seen as the result of the interaction between a person and their environment, not something that is inherent within the individual as the result of an impairment. The Committee notes that a person may be perceived to have disabilities in one society or setting but not in another, which can depend on the assistance available as well as cultural considerations. Articles 5 and 24(1) of the Convention on the Rights of Persons with Disabilities (CRPD), confirms that the right to education must be guaranteed without discrimination and on the basis of equality of opportunity. Discrimination can take different forms, both direct and indirect. Direct discrimination is when a person is treated less favourably on the basis of disability, for example, if a school refuses to admit students with disabilities. Indirect discrimination is when a practice, policy or rule that applies to everyone disadvantages or disproportionately affects people with disabilities, for example, if fixed requirements must be met to graduate from secondary school and the effect is to prevent a student with disabilities from graduating (see the case of Rodriguez). Discrimination can impact on different aspects of the right to education including both accessibility and quality. For example, failure to make facilities accessible to enable students with disabilities to have access to them is discriminatory, whilst failure to adapt a curriculum or instruction to take account of a learner with disabilities’ needs, thus impacting on the quality of their education, could also amount to discrimination. States Parties to the CRPD, as well to the International Covenant on Economic, Social and Cultural Rights (CESCR) and the Convention on the Rights of the Child (CRC), have an immediate and minimum core obligation to prohibit all discrimination on the basis of disability and must guarantee to all persons with disabilities equal and effective protection against discrimination on all grounds. This includes the obligation to adopt a non-rejection from regular education policy and the duty to provide reasonable accommodation to students with disabilities. Article 6 of the CRPD recognises that women and girls with disabilities are subject to multiple discrimination and provides that States Parties must adopt measures to ensure the equal enjoyment of their rights. The Committee on the Rights of Persons with Disabilities in its interpretation of Article 24 in General Comment 4 provides that states must identify and remove barriers and put in place specific measures to ensure that the right to education of women and girls with disabilities is not hampered by gender and/or disability-based discrimination, stigma, or prejudice. People with disabilities can also experience intersectional discrimination based on their disability and other grounds, including, but not limited to: gender, religion, legal status, ethnic origin, age, sexual orientation, or language. People with disabilities may also experience discrimination based on the context they are in. For example, in situations of armed conflict, humanitarian emergencies, health emergencies, and natural disasters. Children with disabilities are often overlooked in such emergencies and are at risk of becoming even more marginalised. There is also an increased risk of sexual violence in such settings. In General Comment 4 the CRPD Committee asserts that states should adopt inclusive Disaster Risk Reduction strategies for school safety and security in emergencies which are sensitive to learners with disabilities. Temporary learning environments in such contexts must ensure the rights of people with disabilities. This includes accessible school facilities and educational materials. Learners with disabilities must not be denied access to education establishments on the basis that their evacuation in emergency situations would be impossible, and reasonable accommodations must be provided. For more information on the impact of conflicts and other emergencies on education, see Right to Education Initiative’s page on education in emergencies. Exclusion and segregation are discriminatory practices that are prohibited by international human rights law. Article 24 (2)(a) of the Convention on the Rights of Persons with Disabilities (CRPD) prohibits the exclusion of persons with disabilities from the general education system, including any legislation or regulations that limit their inclusion on the basis of their impairment or its ‘degree’. Exclusion occurs when students are directly or indirectly prevented from or denied access to education in any form. Direct exclusion would include classifying certain students as ‘non-educable’ and therefore deeming them ineligible for school education. Indirect exclusion would include a school setting a common entry exam without making reasonable accommodations for people with disabilities. Segregation occurs when the education of students with disabilities is provided in separate environments, designed or used to respond to a particular or various impairments, in isolation from other students. CRPD General Comment 4 makes clear that excluding or segregating persons with disabilities from the general education system constitutes discrimination. States must prevent such discrimination by providing reasonable accommodation and developing support systems and accessible learning environments. The Committee makes the distinction between integration and inclusion. Integration is a discriminatory process of placing persons with disabilities in existing mainstream educational institutions as long as they can adjust to the standardised requirements of the institution. Inclusion, in contrast, involves modifying content, teaching methods, and structures to provide all students with an equal and participatory learning experience which meets their individual requirements. The Committee makes clear that placing students with disabilities within mainstream classes without also making structural changes to for example, curriculum or teaching strategies, does not constitute inclusion. For examples of exclusion and segregation, see Human Rights Watch’s reports 'Complicit in Exclusion' - South Africa’s failure to guarantee an inclusive education for children with disabilities (2015) and ‘As long as they let us stay in class’: Barriers to education for persons with disabilities in China (2013). In recognition of the widespread exclusion of people with disabilities from education, human rights and disability rights movements have promoted ‘inclusive education’. This represents a move away from the ‘special education’ paradigm which promotes two separate education systems: one for people with disabilities, often referred to as ‘special education’ and one for people without disabilities, known as ‘general education’, and the ‘integration’ model of education whereby children are integrated into general education with some adaptations but the overall system of education is not adapted towards the needs of learners with disabilities. It was not until the 1994 Salamanca Statement that a shift was made towards the concept of ‘inclusive education’. The Committee on the Rights of the Child, in General Comment 9 (2007) on the rights of children with disabilities, also then affirmed that inclusive education should be the goal of educating children with disabilities. This led to the recognition within the Convention on the Rights of Persons with Disabilities (CRPD) of inclusive education as the best means by which to make the right to education effective for people with disabilities. For more information on the development of the inclusive education approach, see the former Special Rapporteur on the right to education’s report The right to education of persons with disabilities (2007) and OHCHR’s Thematic study on the rights of persons with disabilities in education, requested by the Human Rights Council (2013). Article 24(1), CRPD provides that states must ensure an inclusive education system at all levels with a view to realising the right to education without discrimination and on the basis of equal opportunity. In 2016 the CRPD Committee issued General Comment 4 on the right to inclusive education. The Committee’s interpretation of inclusive education offers a vision of an inclusive education system for all children, including those with disabilities. It promotes a global education system that reflects and can lead to the development of inclusive, peaceful, and fair societies. Although inclusive education is commonly associated with the education of people with disabilities, it is in fact, applicable to all learners. The Committee on the Rights of Persons with Disabilities in General Comment 4 has clearly defined inclusive education as a human right of every learner. Inclusive education is based on the principle that all children should learn together, regardless of difference. Inclusive education recognises the capacity of every person to learn, including people with disabilities, and acknowledges that each person has different strengths, requirements, and learning styles. Inclusion, therefore, takes an individualised approach with curricula, teaching, and learning methods that are flexible and adaptable. By taking into account differences among learners, inclusive education promotes respect for and value of diversity and seeks to combat discriminatory attitudes both in the classroom and society. Inclusive education takes on particular features in application to people with disabilities. It seeks to address the specific barriers people with disabilities face in enjoyment of their right to education, through supports and accommodations, and ensure their effective access to education and fulfilment of their individual potential on equal terms to other students within a participatory learning environment. General Comment 13 of the Committee on Economic, Social and Cultural Rights sets out the interrelated and essential features of the right to education, known as the ‘4As’ (see also ‘what are the 4 As?’ on our page Understanding education as a right). Inclusive education is a concept that brings these essential features together to remove barriers and promote enjoyment of the right to education for all, especially of those groups at risk of marginalisation, including people with disabilities. General Comment 13 of the Committee on Economic, Social and Cultural Rights provides that educational institutions and programmes must be accessible to everyone, without discrimination. Article 9(1)(a), of the Convention on the Rights of Persons with Disabilities (CRPD) provides that states must take appropriate steps to make schools accessible to persons with disabilities. The CRPD Committee’s General Comment 2 on Accessibility makes clear, however, that it is not just the school building that must be accessible, but the entire education system including: information and communication, assistive systems, curriculum, education materials, teaching methods, assessment and language and support services. The whole environment must be designed in a way that fosters inclusion of students with disabilities and guarantees their equality throughout their education. Article 24(2)(b), CRPD also requires states to ensure that persons with disabilities can access an inclusive, quality, and free primary education and secondary education on an equal basis with others. Students must be able to access education within the community in which they live, which means the educational environment must be reachable for persons with disabilities, including through safe transport. The Committee asserts that states should prevent the building of future education facilities that are inaccessible and should establish a monitoring mechanism and time frame for already existing education environments to be made accessible. The Committee calls for states to commit to the introduction of Universal Design. Universal Design is defined in Article 2, CRPD and means the design of products, environments, programmes, and services to be usable by all people, to the greatest extent possible, without the need for adaptation. It does not exclude assistive devices for particular groups where this is needed. There continues to be a widespread global lack of textbooks and learning materials in accessible formats and languages, including sign languages. The Committee highlights that to meet their obligations to provide access to inclusive education, states must invest in developing such resources, and should ratify and implement the Marrakesh Treaty to Facilitate Access to Published Works for Persons Who Are Blind, Visually Impaired or Otherwise Print Disabled. The CRPD Committee affirms that accessibility also requires that education at all levels be affordable for students with disabilities. Free primary education for all particularly implies that accessibility measures should be free of charge. In their 2013 thematic report the Human Rights Committee cite the Finnish Basic Education Act as a good example of this, because it provides that a pupil with disability has the right to free interpretation and assistance services in order to participate in education. Acceptability means that the form and substance of education must be acceptable to all students. States, therefore, have an obligation to ensure all education-related facilities, goods, and services are designed and implemented in a way that takes into account and respects the needs, cultures, views, and languages of persons with disabilities. Education must also be of an acceptable quality for all students and states must adopt positive measures to ensure this is the case for students with disabilities. Inclusive education must, therefore, aim at promoting respect for all persons by developing learning environments, cultures, and curricula which reflect the value of diversity. Textbooks play an important part in the shaping of values and should, therefore, include positive representations of persons with disabilities rather than harmful stereotypes. Availability means that states must ensure that there are enough good quality functioning educational institutions with places available for learners with disabilities at all levels. Adaptability means that education must be flexible and adapt to the changing needs of societies and the diverse needs of students in different social and cultural settings. Curricula must be designed and applied to adapt to the requirements of every student and standardised tests must be replaced by flexible and varied forms of assessments, recognising different routes to learning and the progress of individual students towards broad goals. Article 24(2)(d) of the Convention on the Rights of Persons with Disabilities (CRPD) requires states to ensure that persons with disabilities receive the support they need for their effective education, provided within the general education system. This support can be provided through the general availability of education services and facilities, such as trained school counsellors and other professionals. Article 24(2)(e), CRPD further requires that individualised support measures are provided to maximise academic and social development, in line with the aim of full inclusion of persons with disabilities. In CRPD General Comment 4 the Committee emphasises the need for individualised education plans to identify any reasonable accommodations and specific support required by individual students. The nature of the provision must be determined in collaboration with the student, and where appropriate with parents or caregivers. Adapted teaching methods, materials and modes of communication are particularly important for enabling students with disabilities to learn life and social development skills in accordance with Article 24(3), CRPD. However, in General Comment 4 the Committee observes that many states are still failing to make appropriate provision for persons with disabilities to gain these skills. The Committee makes a series of specific recommendations for provision and investment in order for states to meet this obligation, including providing blind and partially sighted students with opportunities to learn Braille and alternative modes, means and formats of communication and providing deaf and hard of hearing students with the opportunity to learn sign language. In addition to these immediately enforceable aspects of the right to education, under Article 4(2) of the Convention on the Rights of Persons with Disabilities (CRPD) there is a general obligation on states to undertake measures to the maximum of their available resources, and, where needed, within a framework of international cooperation, with a view to progressively achieving the full realisation of the right to education. This means that states have a specific and continuing obligation to move ‘expeditiously and effectively’ towards the full realisation of inclusive education. In addition to obligations of immediate effect and progressive realisation, states must also respect, protect, and fulfil the right to education of people with disabilities. The obligation to respect requires avoiding measures that prevent the enjoyment of the right, such as legislation excluding certain children with disabilities from education. The obligation to protect requires taking steps to stop third parties interfering with the right to education, for example, private institutions refusing to enrol people with disabilities based on their impairment or for reasons of cost. The obligation to fulfil requires the state to take positive measures to ensure people with disabilities can enjoy their right to education, for example, by making education institutions accessible. For information on states’ legal obligations, see Maastrict University Moving towards inclusive education as a human right: An analysis of international legal obligations to implement inclusive education in law and policy (2007). The Committee on the Rights of Persons with Disabilities in General Comment 4 also sets outs specific state obligations regarding the implementation of inclusive education. The Committee recognises that implementation of inclusive education requires a radical shift in culture, policy and practice at both the systemic and school level; with changes in legislation, policy, and the mechanisms for financing, administration, design, delivery and monitoring of education. The Committee calls on states to adopt a whole systems approach, by investing all resources towards embedding inclusive education and by ensuring that implementation is the responsibility of everyone within the education environment, not just classroom teachers. 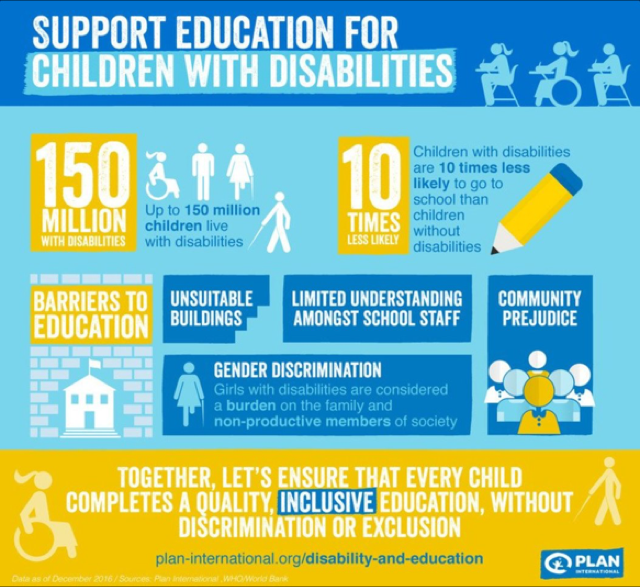 The Committee identifies lack of understanding and capacity of school staff as a significant barrier to inclusive education, and asserts that states must ensure that all teachers are trained in inclusive education based on the human rights model of disability and must invest in the recruitment and ongoing education of teachers with disabilities. Article 24(3)(c), CRPD has been held by some commentators to provide a potential exemption for children who are blind, deaf or deaf-blind, where the provision: ‘environments which maximise academic and social development’ has been understood to authorise special schools for those groups of children. However, in the recent General Comment 4, when addressing Article 24(3)(c) the Committee emphasised that: ‘for such inclusive environments to occur, States parties should provide the required support…’ The environment referred to is an ‘inclusive’ one, and no mention is made here of special schools. For further information on the range of measures states have undertaken to implement the right to inclusive education, see: UNESCO The right to education for persons with disabilities: Overview of the measures supporting the right to education for persons with disabilities reported on by Member States (2015). Article 24(2)(c), Convention on the Rights of Persons with Disabilities (CRPD), requires states to provide reasonable accommodation for individual students to enable them to access an inclusive education on an equal basis with others. Reasonable accommodation is defined in CRPD, Article 2 as appropriate modification and adjustments which are necessary, in a particular case, to ensure persons with disabilities can enjoy, on an equal basis with others, all human rights and fundamental freedoms. Accommodations may be material, for example, providing handouts in alternative formats or use of assistive technology, or non-material, for example, allowing a student more time. Discussions must take place between educational authorities, the academic institution and the student with disability (and if appropriate their parents/caregivers), to ensure that the accommodation meets the needs and choices of the student and can be implemented by the institution provider. General Comment 4 of the Committee on the Rights of Persons with Disabilities explains that ‘reasonableness’ is a context-specific test. It involves an analysis of the relevance and effectiveness of the specific accommodation, including whether it counters discrimination. The resources and financial implications of providing the specific accommodation are recognised as legitimate considerations when assessing whether it would impose a ‘disproportionate burden’ on the provider. However, the extent to which reasonable accommodation is provided must be considered in light of the overall obligation on states to develop an inclusive education system through maximising the use of existing resources and developing new ones. The CRPD Committee explicitly affirms that using lack of resources and financial crises to justify a failure to progress towards inclusive education is a violation of Article 24. In General Comment 2 the CRPD Committee makes a clear distinction between accessibility and reasonable accommodation which is reiterated in General Comment 4. Accessibility is a general duty to groups, whereas reasonable accommodation is a specific obligation to an individual. States have a duty to implement accessibility before receiving an individual request to use a place or service. In contrast, the duty to provide reasonable accommodation is enforceable from the moment an individual makes a request in a specific situation. Reasonable accommodation is, therefore, an anti-discrimination measure to be realised with immediate effect. In General Comment 4 the CRPD Committee makes clear that the denial of reasonable accommodation constitutes discrimination and is a violation of the Convention. This would include in private schools, which have an obligation to ‘take all appropriate measures to eliminate discrimination on the basis of disability’ under Article 4(1)(e) of the CRPD. Provision of reasonable accommodation should not be conditional on a medical diagnosis of impairment and should instead be based on the evaluation of social barriers to education. Further, the provision of reasonable accommodation should not involve extra costs for learners with disabilities. For further information on reasonable accommodation see also the Human Rights Council’s Thematic study on equality and non-discrimination under Article 5 of the CRPD (2016). In 2007 the UN Special Rapporteur on the right to education observed the discrepancy that exists ‘between the normative framework and the resources available for realising the right to inclusive education, as well as the lack of genuine political will to achieve this goal’ (The right to education of persons with disabilities, 2007). Almost ten years later in General Comment 4 the Committee on the Rights of Persons with Disabilities listed lack of political will as an ongoing barrier to the implementation of inclusive education. States have, however, in 2015 made a further political commitment to realisation of the right to inclusive education through Sustainable Development Goal 4 (SDG4) of the 2030 Agenda for Sustainable Development. SDG4 is rights-based and reads: ‘Ensure inclusive and equitable quality education and promote lifelong learning opportunities for all.’ This means that the targets associated with achieving this goal are largely consistent with international human rights law, and as such the implementation of legal and policy frameworks to realise SDG4 must be consistent with states’ obligations under international human rights law, including the provisions of the Convention on the Rights of the Persons with Disabilities (CRPD) related to inclusive education. For example, targets 4.3-4.7, which are broadly concerned with lifelong learning, must be implemented in line with Article 24(5), CRPD which provides that states should ensure that persons with disabilities are able to access general tertiary education, vocational training, adult education and lifelong learning, without discrimination and on an equal basis with others. This would include an obligation to identify and remove barriers to education at these levels to ensure equal access and provide reasonable accommodations to ensure that students with disabilities are not discriminated against. It should be noted that the notion of inclusive education in SDG4 is not limited to persons with disabilities, but captures a broad vision of inclusive education for all. SDG4 also sets out targets that are not explicit in human rights law, for example, target 4.2 requires States to ensure quality pre-primary education. In General Comment 4, the CRPD Committee notes that early childhood interventions can be particularly valuable for children with disabilities by strengthening their capacity to benefit from education and promoting their enrolment and attendance, and transition to primary inclusive settings. For more information on SDG4 see our page on Education 2030. Article 31, Convention on the Rights of Persons with Disabilities (CRPD) provides that states must collect data to enable them to design and implement policies which give effect to the Convention. The data collected must be disaggregated and used to help assess how far states have met their obligations, to identify barriers faced by people with disabilities in exercising their Convention rights, and for the development of effective policies and interventions to promote inclusive and quality education. Article 33, CRPD further provides that states must establish a framework, including independent mechanisms, to promote, protect and monitor implementation of the Convention. Article 33 also stipulates that persons with disabilities and their representative organisations must participate fully in the monitoring process. The Committee on the Rights of Persons with Disabilities’ General Comment 4 emphasises that persons with disabilities must be recognised as partners, not merely recipients of education. States must therefore consult persons with disabilities, including children with disabilities through their representative organisations, in all aspects of planning, implementation, monitoring and evaluation of inclusive education policies. For indicators on the right to education of people with disabilities, see our Indicators Selection Tool and Structural indicators for inclusive systems in and around schools (2017). For information on UNESCO’s approach to data on the education of people with disabilities see their Factsheet (2017). For guidance on reporting, see International Disability Alliance Effective use of international human rights monitoring mechanisms to protect the rights of persons with disabilities (2010). For a full list see our International Instruments - the Right of Education of Persons with Disabilities. The Supreme Court of Canada upheld a decision of the British Columbia Human Rights Tribunal that the Board of Education of School District No. 44 (North Vancouver) by closing a facility that provided intensive services and individualised assistance to students with severe learning disabilities, had denied a child with severe dyslexia access to a service customarily available to the public, being education, contrary to the British Columbia Human Rights Code. Although the School District was subject to severe funding constraints, it was found to have not acted with a bona fide and reasonable justification, which could have provided a defence to the Human Rights Code violation. In this decision, the Court found that the right to education of a disabled child had been violated when the educational institution did not award an official certificate of completion for his secondary education, even after the student had met all the requirements of his personalised education project because his project did not comply with the minimum requirements under local regulations. The Court concluded that people with disabilities have the right to an inclusive education on an equal basis with others, and this includes the right to have their capabilities and accomplishments certified under equal conditions. ‘Equal conditions’ does not necessarily mean identical requirements but rather, making reasonable adjustments to ensure that individuals are treated as equals. Namely, the Court explained that the plaintiff, having met the specific requirements of his project and having attended and passed 5 years of courses at the institution, had the same right as his classmates that had met the requirements imposed on them to receive a certificate.